Record high temperatures combined with dry weather to plunge the Southeast United States deeper into drought in August 2007. Some states, including Tennessee, Alabama, and Georgia, were in exceptional drought, the highest rating on a five-point scale designated by the U.S. Drought Monitor. 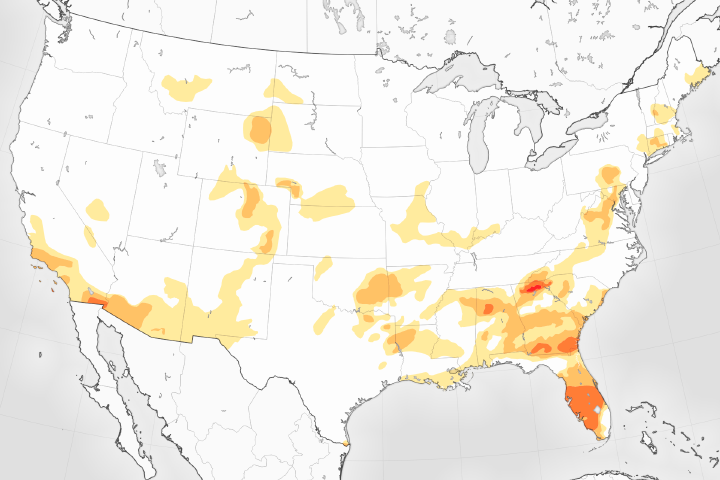 In early August, a record-breaking heat wave settled over the southeastern United States, where land was already parched from a lack of rain. The temperatures baked the dry soil, leaving it even drier, and stream flows dropped. The impact of the drought on vegetation is illustrated in this vegetation anomaly image, which was made with data collected by the Moderate Resolution Imaging Spectroradiometer (MODIS) on NASA’s Terra satellite between August 13 and August 28, 2007. Areas where plants were less lush than they had been on average since 2000 are brown, while better-than-average conditions are green. Normal conditions are yellow, and areas that were covered in clouds are gray. 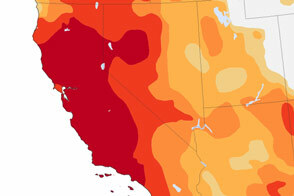 The prevalence of brown in this image shows the wide-spread nature of the drought. The strongest drought signal is in southern Kentucky and northern Tennessee. According to the U.S. Drought Monitor, 87 percent of the topsoil in Tennessee and Kentucky was rated dry or very dry between August 14 and August 21. In Tennessee, 84 percent of pastures were in poor to very poor condition during the same period, a figure that matches the conditions illustrated here. 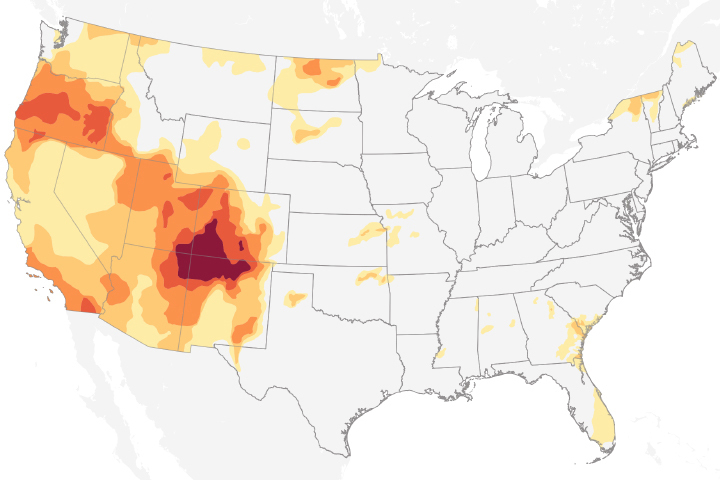 By the end of May 2007, drought had set in over both the southeastern and the southwestern United States, while excess rain fell in the interior. 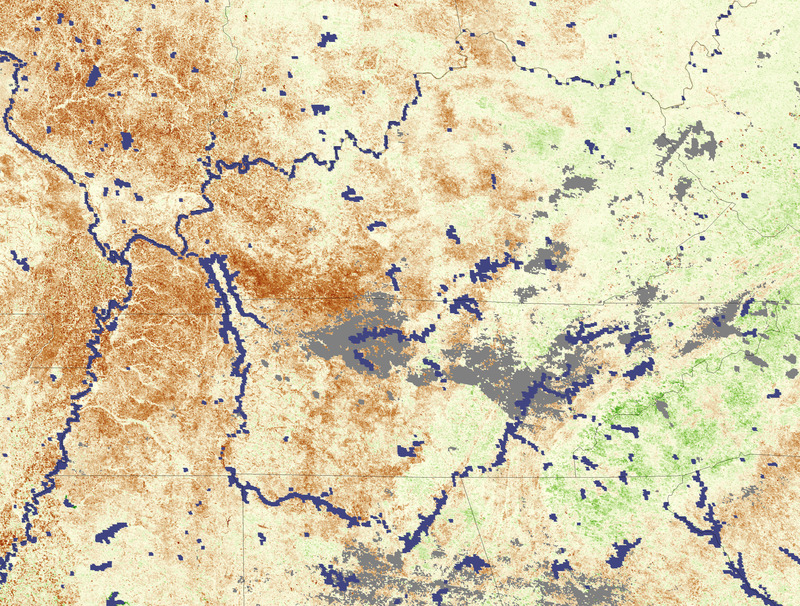 This vegetation index image reflects plant growth in response to the drought and rain. 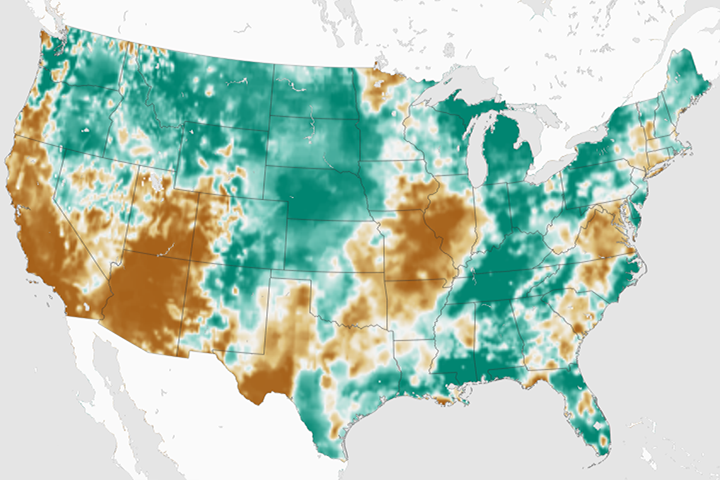 Drought Has Disappeared from Much of the U.S.